Present state: All the station buildings including the roadside booking office were demolished in June 2005, only the platforms remain. Notes: Ditton Station was opened as Ditton Junction on the 1st May 1871. The station was situated on the former St Helens and Runcorn Gap Railway that had opened between Widnes and Garston on the 1st July 1852. 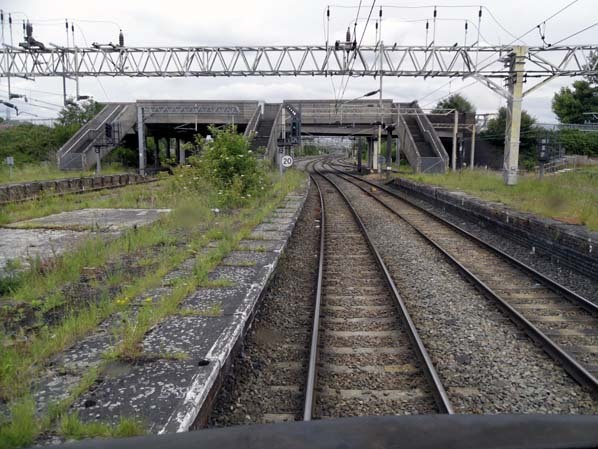 By 1853 that line had been extended to the east as far as Stockport and on the 15th February 1864 a connection opened between Speke and Edge Hill which provided access to the London North Western Railway’s (LNWR) main line station at Liverpool Lime Street. By the end of 1864 the line had become part of the LNWR. In 1863 the LNWR began construction of a new line from Ditton to a point just to the north of the River Weaver on the main line between Warrington and Birmingham. The purpose of the new line that had to cross the River Mersey at Runcorn Gap was to shorten journey times between Liverpool and London. The new line opened to goods trains on the 1st February 1869 and to passenger services on the 1st of April 1869. At Ditton the new line required the laying out of a junction with the original line and extensive earthworks to create an incline that would allow the new line to reach the required height so that it could cross the River Mersey with 75 feet of clearance which was required by the Admiralty. There had been a station at Ditton called Ditton Mill since 1851 but the alterations required for the new route meant that this station had to close. Ditton Junction was built as replacement for the earlier station. Ditton Junction station was located on the west side of a road overbridge. Its booking office was located on the overbridge and it straddled the line. The book office was a brick built single storey building with archway windows and doors. At the high point of the pitched roof glass panelling was provided to provide natural daylight into the building. 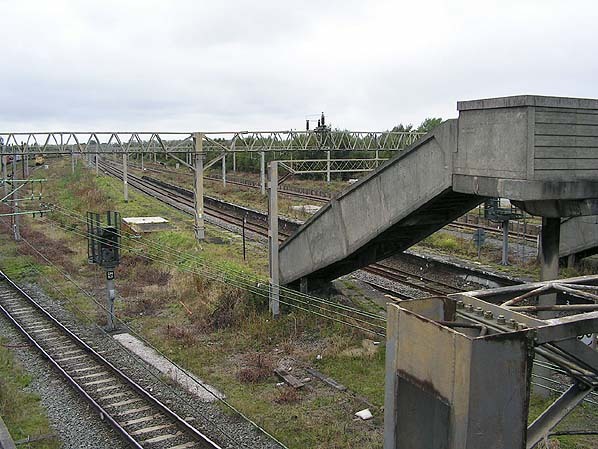 A footbridge connected down to three island platforms, which gave six platform faces. The station was not at the time of its opening located in an area of large population but its size reflected its importance as an interchange junction. 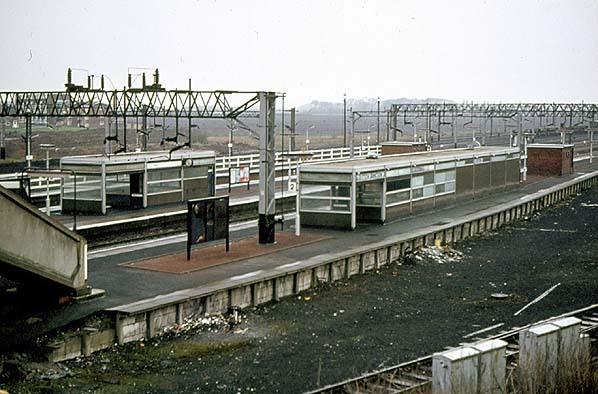 Each platform was provided with brick built waiting facilities and staff accommodation. Canopies were also provided to protect passengers from the weather. Goods facilities, including a cattle dock were also provided. Liverpool, Warrington, Manchester and points to the east, and a local service to St Helens which terminated at the station. Within twenty years direct services also ran to Chester. On the 17th September 1912 a serious crash occurred at the station when a the 5.30 Chester to Liverpool Train hauled by Precedent 2-4-0 No. 1529 Cook with two horse boxes and seven coaches descended the 1 in 114 from the Bridge at 60 mph hit the road bridge at the station. The accident occurred because of confusion over signals. The driver thought that the train was to take the fast lines through the station but in fact the points were set for the slow lines. The train crew were killed along with all of the passengers in the first two coaches. A horse was thrown right over the bridge but somehow managed to survive. By the early part of the 20th century services had settled into a pattern that included several Liverpool to London and return workings each day. Peak hour services between Liverpool and Manchester Oxford Road, peak hour services between Manchester Oxford Road and Liverpool and local services between Liverpool and Crewe and Liverpool and Chester. Less frequently services also operated between Liverpool and North Wales. Services also started and finished at Ditton Junction. These included the local service to St Helens, a service to Hartford and off peak services to Manchester Oxford Road and to Warrington Bank Quay. In 1923 Ditton Junction became part of the London Midland and Scottish Railway (LMS). Nothing much altered during the LMS era other than livery changes. Ditton Junction remained a busy junction station on a busy main line. 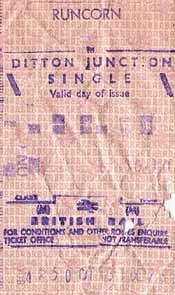 In 1948 Ditton Junction became part of the British Railways (London Midland Region). During the Second World War the St Helens service had been reduced to allow more goods services to run. By 1951 the service had still not been restored to its pre war levels and it was discontinued on 18.06.1951. Other services at Ditton Junction were not really affected by the loss of this service as connections with other trains had not been very good anyway. 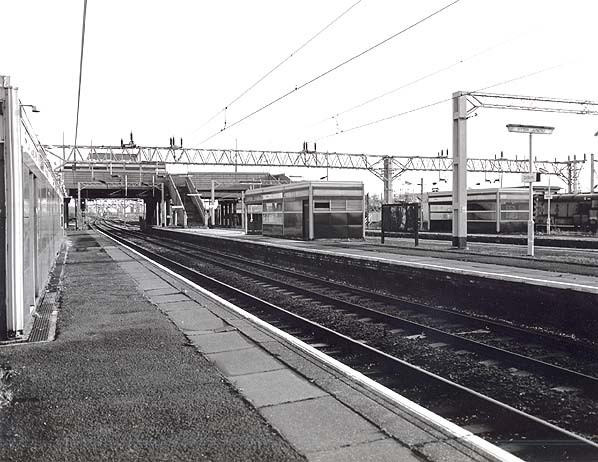 Between 1960 and 1961 the station was completely rebuilt in a modern style to accommodate the electrification of the Crewe to Liverpool Line. One of the platform faces, on the south side of the southernmost island platform, was dispensed with leaving the station with five platform faces. The booking office and platform buildings were all rebuilt with plenty of accommodation for passengers who who would be changing trains. It was ironic therefore that the Manchester Oxford Road service, and its shorter workings to Warrington were withdrawn on 10.9.1962, all intermediate stations between Ditton and Timperley closed on the same day with the exception of Warrington Bank Quay Low Level which continued to be served by one train per week until 1965. In 1965 Ditton lost its five remaining London Euston services and goods services were withdrawn on 31.5.1965. The only remaining passenger services were an hourly service between Liverpool and Crewe and a less frequent service to Chester. 'Junction' was dropped from the stations name in 1973 although only the totem signs were replaced with the new name ‘Ditton’. The stations lamp covers continued to carry the name 'Ditton Junction' until the stations closure in 1994. By the late 1970s the Chester service operated only in the summer months and it was discontinued in the early 1980s. By the late 1980's many trains on the Liverpool and Crewe service had started to omit Ditton from their scheduled stops. By the early 90's only a couple of trains called at the station and then only at peak times leaving a gap of several hours in the timetable. 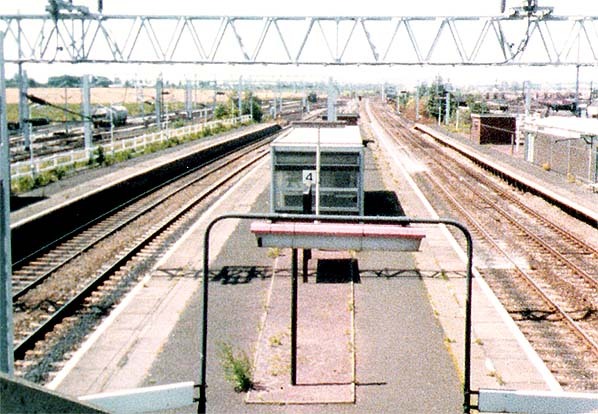 Not surprisingly very few people used the station and it made headline news when it closed on 27th May 1994 as it was the first post privatisation station to be closed by the new track company Railtrack. To publise what many saw as a bad omen of the new privatisation era a mock funeral, complete with coffin was held on the stations platform as the last train, a class 142 Diesel Multiple Unit departed towards Liverpool. The platform level buildings were demolished shortly after closure. The street level building survived, until June 2005 when it was demolished. Rail activity around the site of Ditton Station has become more frequent in recent years as many new freight facilities have been created a short distance to the east of the station site. Freight trains that serve these new facilities run into Ditton sidings before they are propelled into the freight terminals. 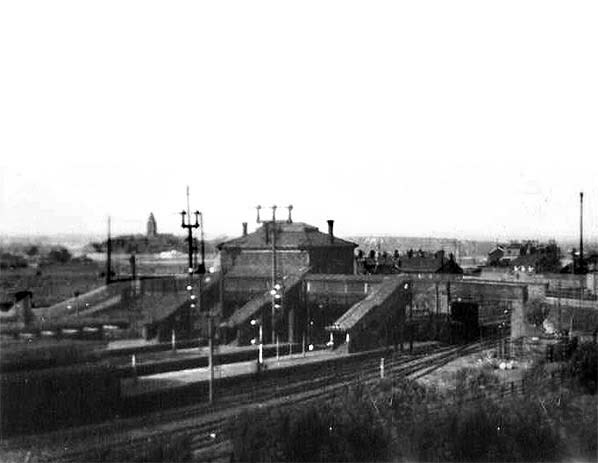 Ditton Junction station in the 1950s seen from the tower of the nearby water softening plant. Looking north west at Ditton station in September 2009. The nearest platform to the photographer was platform 5 and 6. It became just 5 from 1960 when the station was rebuilt. Platform 6 was taken out of use at that time. Looking east along the former Ditton Junction station's platform 4 in June 2011. The station footbridge can be seen at the far end of the platform.